The Department of Planning and Environment is working closely with City of Ryde Council and Transport for NSW to develop new plans for Macquarie Park. The investigations will identify opportunities to enhance the area’s existing role as a major commercial centre and innovation district. This will also include investigating opportunities for securing the commercial future of Macquarie Park. The investigations will also identify the infrastructure needed to support the sustainable development of Macquarie Park into the future, including improvements to roads, cycle and pedestrian links, schools, open spaces and community facilities. As part of the investigations, the Department has engaged internationally leading masterplanners, Arup (UK), to explore the value created by bringing cultural, educational and commercial industries together around great public realm and capture the value of connectivity. Preliminary background studies including urban design, social infrastructure and open space, transport and economics, are currently being finalised. In late October 2017, the Department and Arup staff met with a range of stakeholders to explore key issues exploring Macquarie Park including quality of place, competitiveness, culture and collaboration, diversity and critical mass. Feedback received, together with previous community input and other technical studies, will assist in the development of a vision which informs the draft Land Use and Infrastructure Implementation Plan, to be released in mid 2018. A copy of the Department and Arup’s presentation from the landowner information session can be found in the documents section below. On 23 November 2016 a panel discussion was held to engage with local business stakeholders. Attendees participated in a lively panel discussion on the future of Macquarie Park as one of Australia’s premier Innovation Districts. Panel members included the Minister for Innovation and Better Regulation and Member for Ryde the Hon Victor Dominello MP, NSW Chief Planner Gary White, Deputy Government Architect Ben Hewett, Petra Andrén, CEO of Cicada Innovations and Mark Broomfield, Director of Property at Macquarie University. If you would like to view the presentation from the event, see the Documents section below. Three online surveys have been conducted to date. The first survey was conducted in 2016 to get community feedback about how to make Macquarie Park an even better place to live and work. More than 1,000 people took part, and identified access to public transport, living close to where they work, and access to the Macquarie Centre as the top three things they liked about the area. The second survey was conducted during the Destination Innovation event in November 2016, to get input on how to make Macquarie Park Australia’s premier innovation centre. Over 100 people responded and identified the need for a new vision and strategic plan for Macquarie Park, as well as strong links between the NSW Government, Macquarie University and high tech stakeholders as being two of the key ingredients required to drive innovation. 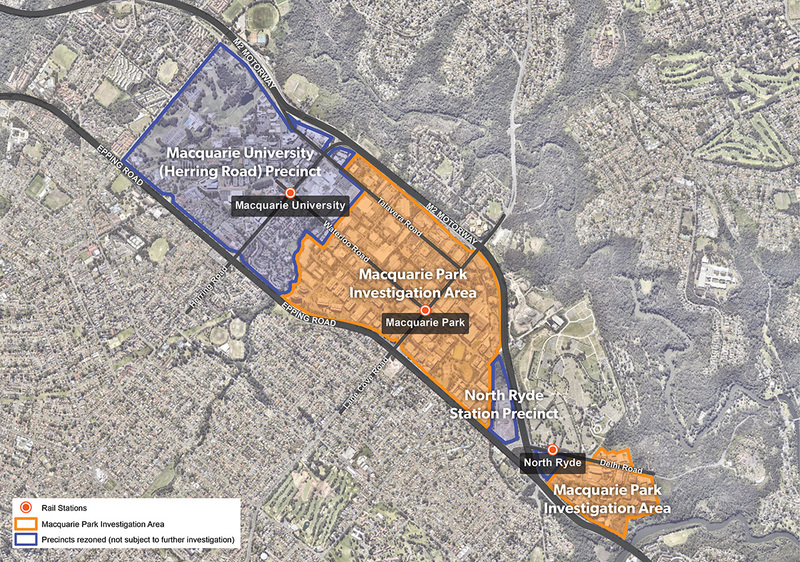 Results of these surveys can be found in the Documents section below and will be used to help inform the future vision of Macquarie Park, as well as identifying key priorities and issues in planning for the area. We want to continue the conversation with stakeholders and the community and there will be ongoing opportunities to get involved throughout the investigation process. We will be releasing further information shortly on the progress of the investigation.